Two drug dealers took police on a high-speed chase the wrong way through rush-hour traffic while a five-year-old child was in the car. The vehicle reached 87mph (140kph) and was driven the wrong way around a roundabout, Carlisle Crown Court heard. 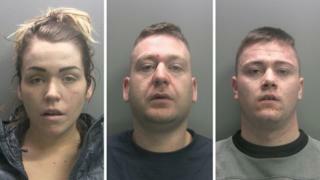 Stephen Irwin and Natasha Graham were jailed after admitting possessing cocaine with intent to supply. Irwin also admitted several driving offences. A third person, Steven Kidd, was jailed for supplying cocaine. The Saab sped away from police on Longlands Road in Carlisle at about 17:00 GMT on 1 February. Officers called off the chase when it became too dangerous to continue, but the Saab eventually crashed into a field and Irwin, 32, and Graham, 25, fled. Prosecutor Gerard Rogerson said they laid low at a Carlisle hotel for several days, where a "steady stream of drug customers" visited a room in which police later found the pair along with cocaine potentially with a street value of almost £5,000 and cash. Graham was on bail having previously been arrested with another drug dealer, 21-year-old Steven Kidd, on 29 December 2017. Police had found nine bags of crack cocaine in Kidd's underwear. A search of Graham and Kidd's home in Toronto Street, Currock, revealed bags and weighing scales, along with £1,000 cash. Judge Peter Davies said he had risked "momentous danger". "God knows how catastrophe was averted," he added. Irwin, of Eskdale Avenue, Carlisle, was jailed for seven-and-a-half years and must serve a driving ban upon his release. Graham, said to have played a secondary role in the drug trafficking, was jailed for three years and nine months. Kidd was given a three-and-a-half year prison sentence having admitted his guilt.